The PFAC assisted in choosing the ED flooring. The PFAC members completed a questionnaire asking their opinion on whether or not Essential Oils would be beneficial in the waiting room. Essential oils have been incorporated into the registration are as well as the ED waiting room! The PFAC went on a tour of the hospital focusing on signage; feedback was provided regarding adequate signage, where additional signage would be beneficial, any verbiage that is not welcoming or could be worded differently and any additional feedback was encouraged. The PFAC recommended that suggestion boxes be placed in the hospital and the Family Health Center. Suggestions are now regularly reviewed at PFAC meetings and the suggestions are forwarded on to the appropriate Department Manager(s) since this implementation. The Patient and Family Centered Care in the Emergency Department policy was presented to the PFAC members and feedback was requested regarding what they thought the process should look like. An abundance of valuable feedback was offered. A dress code survey was presented to the PFAC members and they completed a survey regarding employee appearance in the workplace. The PFAC’s feedback was incorporated into the hospital’s District wide dress code policy. The PFAC was presented an admission folder to be provided to each patient admitted to BVCHD. The contents of the admission packet were greatly influenced by the PFAC’s opinions, recommendations and feedback during the implementation process. Qualitick response rates were discussed with the PFAC members. Changes were made based on the PFAC member’s feedback such as when the Emergency Department and Family Health Center should have the patient complete the survey and who should give the tablet to the patient. A recommendation was made by the PFAC members regarding the placement of the tablet at the Family Health Center as it was housed at the discharge window. The Beta Quest for Zero award was presented to the PFAC and recognition certificates were presented to each member in attendance. Part of the award was granted due to 100% of the ED nurses and physicians completing a test and the other part of the award was granted to the PFAC for the creation and implementation of the PFAC. The PFAC members participated in the District wide BETA HEART Focus Groups. The District enrolled in the BETA HEART program and the purpose is to provide clear and transparent communication with adverse outcomes. The PFAC offered valuable feedback during their focus group session. The PFAC members were asked for feedback regarding what questions they would like to be asked when a Department Manager conducts patient rounding. The feedback that was offered was passed on to Department Managers and is part of patient rounding throughout the hospital. The PFAC members had a budgeted amount of money for a project from the PFAC to the hospital. Inspirational quotes hung throughout the hospital was the project that was chosen. Pictures of the Big Bear Valley taken by BVCHD employees shall be hung throughout the hospital. 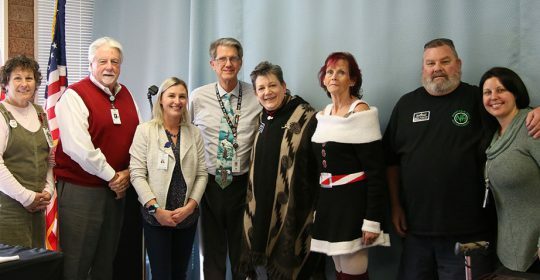 The PFAC members offered valuable information regarding changing the perception of the hospital to the community such as holding Town Hall meetings for the community to voice concerns, creating a board within the hospital that would have a monthly flier with hot topics that are geared toward the community and local radio ads, magazine and newspaper support. A PFAC member reported that the TV in the ED waiting room was not working. A new TV was installed in the waiting room as well as a complimentary charging station for patients. The valuable feedback that the PFAC members offered during the BETA HEART focus group along with the feedback from other departments at the hospital was gathered by BETA and a GAP Analysis PowerPoint presentation was reviewed with the PFAC members. The results of the SCORE Survey and the Communication Survey were reviewed with the PFAC members. Town Hall Meetings with John Friel, CEO have been implemented; the PFAC took a survey regarding how information should be communicated to the community to ensure the public is aware of the Town Hall Meetings. BVCHD is starting the process of the recruitment of new PFAC members. The PFAC members were asked for input regarding the interview and recruitment process such as the best places to advertise being on the council. Input included DOVES, social media, suggestions from current PFAC members and suggestions from Department Managers and staff. An ED Patient Information Packet was presented to the PFAC members and input was requested. With the recommendations from the PFAC, a brochure was created and is now in the ED waiting room for patients. The PFAC members participated in the DON candidate interview process. An abundance of feedback was offered regarding both of the DON candidates.